The third issue of "flush" takes a decidedly radical tone despite the ethereal mood suggested by its cover. This issue was published at the advent of The Summer of Love. I attended the Midwest Archives Conference earlier this year. In addition to the session I participated in, I attended a fascinating presentation by Jenna Freedman, Barnard College zine librarian. She talked about aspects of zines that appeal to archivists, like issues of collecting and preserving zines, but she also just talked about zine culture itself. I have to admit I was hooked. Her handouts were even real DIY mini-zines – hand-lettered with random stickers, printed on the back of paper obviously from the recycling bin. 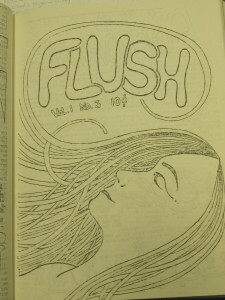 I was pleased to find evidence of an underground press here at Tech when I came across flush, an off-campus newspaper self-published by a band of merry Michigan Tech pranksters in 1968 and ’69. While not a zine in the truest sense of an expression by an individual, flush nonetheless captures the spirit of its time. The inaugural issue claims “flush wants only to enter your mind, to make you aware, to make you THINK.” It’s irreverent and provocative, hand-drawn and full of quotes from the likes of Ché Guevara and Jefferson Airplane. Interspersed with material carefully calculated to shock the establishment of the day are some thoughtful pieces whose writing reflects compassion and commitment toward making positive change in the world. What stood out most to me as an archivist and historian was a two-part interview with three African American students that addresses head-on the experience of being black on a very white campus during a time of great national unrest and social upheaval. Although dates are noticeably absent from much of flush, given the context of some of the pieces it is evident that this interview took place only months following the assassination of Martin Luther King. Over its two-year run, the contents of flush become more politically charged. Although no reason for its demise is indicated, the newsletter gets less cerebral over time, rather far out, to use the vernacular. Student publications have flourished on and off-campus through the years, from sanctioned papers like the Michigan Tech Lode, to boldly sardonic broadsheets like the Daily Bull (reminiscent of flush), to the now dormant TechnoBabe Times. Lamentably, not all of these works make their way into the Archives collections, and some are only incompletely represented in the collections. Do you know of a student publication, or perhaps write for one? Claim your place for posterity and consider placing copies of your newsletter, zine, or publication in the Archives. The Michigan Tech Archives seeks to document the social and cultural history of the Copper Country, and that includes the long relationship between campus and community. Michigan Tech students have been a distinctive presence in the area for 125 years. Make your voice part of the University’s history. Call the Archives at 487-2505, email us at copper@mtu.edu, or just stop by our beautiful reading room and talk to an archivist. While you’re at it, take a look at flush (LD 3347 .F58).